For additional information about this book, visit the website www.lifewithbobbook.com. Why would anyone say "Let's stick wires into someone's brain, run voltage through it, and see what happens!"? 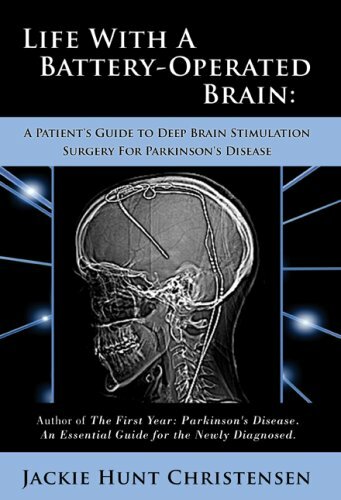 So asks Jackie Hunt Christensen in Life With a Battery-Operated Brain: A Patient's Guide to Deep Brain Stimulation Surgery for Parkinson s Disease Author Christensen answers this question -- and more -- in her unique and comprehensive book, as she has first-hand knowledge of the procedure commonly referred to as DBS. She herself lived with Parkinson's disease for more than seven years before electing to be evaluated for DBS surgery. It was not a fast and easy choice. For Christensen, a fear of DBS surgery -- which involves placing one or two electrical wires inside the brain -- and its potential complications had to be weighed against quality of life without the surgery, a life of increasing parkinsonian symptoms and a growing pharmacopeia of medications, which might help control her symptoms but which could have devastating long-term effects on her body. Ultimately, she was deemed a good candidate for the surgery, and DBS seemed like her only logical option -- a choice that has been validated post-surgery, as Christensen now enjoys life with most of her motor symptoms well controlled. Parkinson's disease, the author is quick to point out, does not end, but DBS is meant to be a long-term treatment. Jackie Hunt Christensen offers a step-by-step look at her own journey, as well as offering information on a typical evaluation process, medical statistics, questions to ask neurosurgeons, opinions from other DBS patients, the programming process for DBS, and much more.Life With a Battery-Operated Brain is a must-read for those who are considering deep brain stimulation and for those who love them. Jackie Hunt Christensen is also the author of The First Year: Parkinson's Disease, An Essential Guide for the Newly Diagnosed and has published numerous articles and editorials regarding both Parkinson's and environmental issues. In 2006, she won the Milly Kondracke Award for Outstanding Advocacy from the Parkinson's Action Network in Washington, DC. Jackie, her husband, and two sons, reside in Minneapolis, MN.